Add form and function with our bluetooth enabled rock light kit. Crawling at night and need to see you exact wheel placement to navigate the trail? 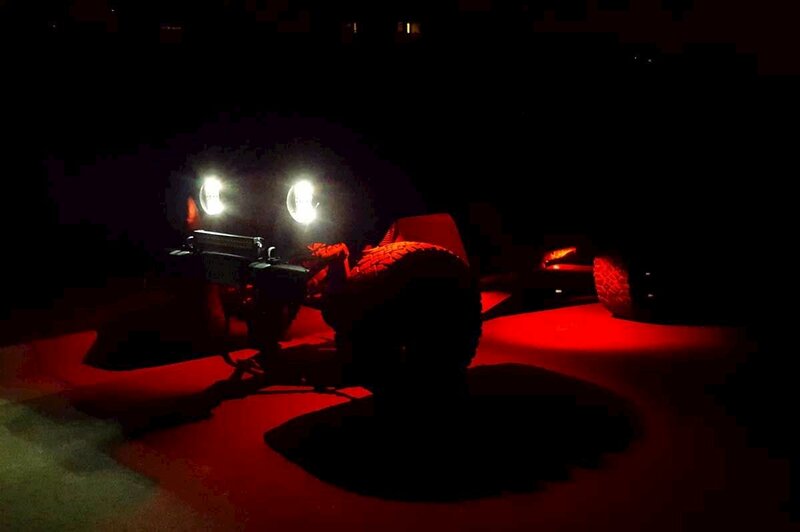 Or do you just want to add some cool under vehicle lighting to add some bling to your ride? With this kit, you get both. For the brightest light, set them to shine bright white. Or when you're just cruising around, show off some custom colors or even multi color transitions with optional user controlled flash patterns. The iPhone or Andriod bluetooth app puts you in full command and lets you have total control over your lighting. From a constant on, single color, to multiple color rotations and flash patterns, your only limit is your creativity. This kit comes with 4 rock lights each with an 11 foot lead, 2 rubber mounting bases (one for flat surface mounting and one for curve surface mounting), and stainless steel screws, washers, and nuts. Each Rock Light includes 3 - 3w CREE LEDs and are constructed with cast aluminum, not plastic! Fully Waterproof, IP68 rated, to take all the beating you can dish out.